Sacred Economics: "This brilliant and beautifully written book is an indispensable must-read for all those who believe our economic system is terminally sick and in need of radical, sacred rehaul. Charles Eisenstein has the great gift of being able to make complex ideas both thrilling and inspiring. I hope this book begins a serious, worldwide conversation on how we can reinvent our attitude to money." --Andrew Harvey, author of The Hope: A Guide to Sacred Activism "While political pundits, financial analysts and Occupiers fumble on how to transcend the intensifying global financial crisis, Eisenstein is trailblazing bold new ideas and possibilities for how we conduct monetary exchange." --Michel Bauwens, founder of the P2P Foundation "With his breadth of knowledge, enthusiasm, commitment, diligence, and sensitivity, Charles has become a beacon of hope for others. Your heart and mind will be opened by this treasure of a book that shines with wisdom of crucial importance to our troubled world today." --Kamran Mofid, founder of the Globalisation for the Common Good Initiative "[Sacred Economics] meticulously explains why our current system will inevitably give rise to cyclical and worsening economic crises. [Eisenstein] exposes the myths and lies that sustain power structure, the social and spiritual devastation in which we are all complicit, and lays the foundation for a way of thinking that can restore hope and help us emerge to a positive future. ... Eisenstein's book provides some of the most creative and hopeful ideas out there." --New Consciousness Review "[Charles Eisenstein] puts his money where his mouth is. 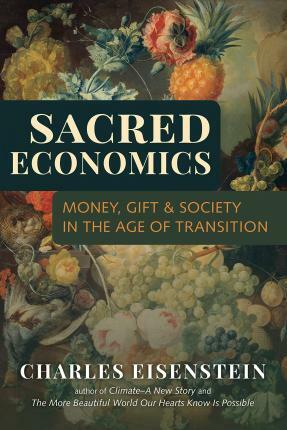 Sacred Economics: Money, Gift and Society in the Age of Transition is published under a Creative Commons copyright. ... This arrangement, similar to that of open-source software, is a tiny sample of the economic system that Eisenstein predicts for our future. ... Of course, a new economy means the old one needs to go. That would be scary news if not for Eisenstein's optimistic way of describing the transition. He effectively argues that when we dismantle monetization, we give birth to community. Together, we can help noble impulses become profitable enterprises. Money may have caused our biggest problems, but redefining it could help us solve those same problems." --Grid Magazine "'If anything is sacred in this world, it is surely not money.' So says Charles Eisenstein, who believes that people can act outside of the money economy, despite the power it has over their lives." --Foreword Reviews "Eisenstein is no revolutionary or anarchist. In fact, he's an evolutionary. While reading Sacred Economics, I realized I had not achieved an objective relationship with our money system. I don't have money. It has me." The Ascent of Humanity: "Brilliant and original, with great depth of insight and understanding, Eisenstein's Ascent of Humanity easily ranks with the works of such giants of our age as David Bohm, Julian Jaynes, Jean Gebser, Whitehead. It is a profoundly serious, indeed somber portrait of our times, even as it opens a door of honest hope amidst the dark destiny we have woven about us. Accept the challenge of this major accomplishment and discover the light shining within it."